Crossing 'Red Lines' on Iran & Palestine Peace? Israel Prime Minister will mostly have his Administration to blame if the world does not heed his words. 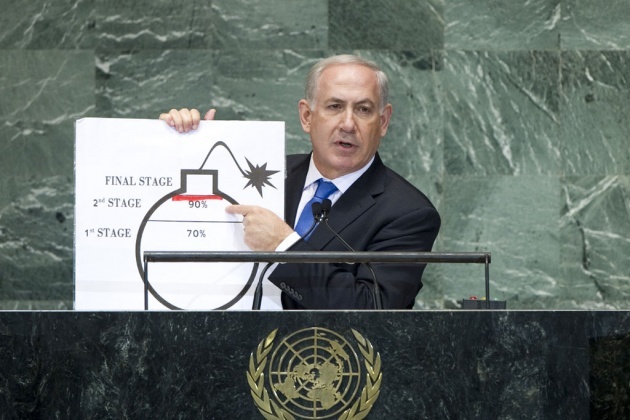 Israel's Prime Minister used visual props to demand that the UN Security Council draw a "red line" below which Iran's Government would not be allowed to cross in the alleged development of nuclear weapons. Much of the world though is also anxious about the lack of resolution to the Israel/Palestine divide viewing the Netanyahu's Government as at best being tardy and worst at having crossed at least one red line in undermining the "Two-State Solution". 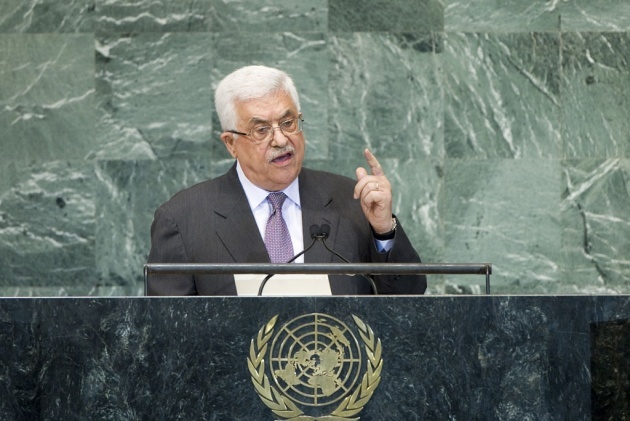 On the same day that Netanyahu spoke, the Head of the Palestinian Authority Mahmoud Abbas urged action for the UN to not only accept Palestine as a non-Member state, but draw lines on the borders of such a state to prevent what he called "ethnic cleansing" by Israeli authorities. “Jerusalem Expulsions Protested by UN Human Rights/Refugee Officials”. President Abbas has effectively accused PM Netanyahu's Government of rejecting the internationally endorsed Two-State solution. “In our endeavour, we do not seek to delegitimize an existing State, that is Israel, but rather to assert the State that must be realized, that is Palestine,” he informed world leaders at the UNGA Debate also addressed by PM Netanyahu, calling on the Security Council to urgently adopt a “binding reference” for achieving the two-state solution. “Despite all the complexities of the prevailing reality and all the frustrations that abound, we say before the international community: there is still a chance – maybe the last – to save the two-state solution and to salvage peace.” Referencing his own Red Line regarding the fading hopes for a "two-state solution which envisages Palestine and Israeli living side by side in peace within secure and recognized borders, Abbas stressed. “Despite our feelings of disappointment and loss of hope, we continue to sincerely extend our hands to the Israeli people to make peace. We realize that ultimately the two peoples must live and coexist, each in their respective State, in the Holy Land. Further, we realize that progress towards making peace is through negotiations between the PLO (Palestine Liberation Organization) and Israel.” There can only be one understanding of Israel's actions, the Palestinian leader said, adding: “That one understanding leads to one conclusion: that the Israeli Government rejects the two-State solution.” According to UN News Centre: Israel has said it is prepared to discuss all matters with the Palestinians without pre-conditions. PM Netanyahu's “clear red line” is drawn to prevent Iran from completing the second stage of nuclear enrichment necessary to make a bomb. “I believe that faced with a clear red line, Iran will back down,” Netanyahu asserted. While Iran assures that its program is for peaceful purposes, many in Israel, the US, Europe and others are not convinced. “This will give more time for sanctions and diplomacy to convince Iran to dismantle its nuclear weapons programme altogether. Israel is in discussions with the United States over this issue, and I am confident that we can chart a path forward together.” (We think it is most likely that Iran is aiming for the capacity to develop a weapon, without necessarily making a bomb, thus enhancing/emboldening its leverage in region and globally). Linking his timetable to the vulnerability of potential Iranian targets and voicing his fear that Iran would use a nuclear bomb to eliminate his nation, the Israeli leader divided bomb production into three stages – low, medium and high enriched uranium. “By next spring, at most by next summer at current enrichment rates, they will have finished the medium enrichment and move on to the final stage. The red line should be drawn right here. Before Iran completes the second stage of nuclear enrichment necessary to make a bomb. Before Iran gets to a point where it's a few months away or a few weeks away from amassing enough enriched uranium to make a nuclear weapon. Each day, that point is getting closer. That's why I speak today with such a sense of urgency. And that's why everyone should have a sense of urgency. The relevant question is not when Iran will get the bomb. The relevant question is at what stage can we no longer stop Iran from getting the bomb. The red line must be drawn on Iran's nuclear enrichment programme because these enrichment facilities are the only nuclear installations that we can definitely see and credibly target,” (as opposed to a small plant/workshop where a nuclear device presumably could be assembled and stored). “Red lines don't lead to war; red lines prevent war,” the Israeli leader declared, saying that history – with its terrible death toll from the Holocaust and World War II – would have been much different had a red line been set against Germany’s Adolf Hitler in the 1930s," PM Netanyahu offered - similar conclusions can be made with respect to Syria today or Bosnia & Herzegovina 20 years earlier where "safe zone" lines were drawn but then crossed. Does Netanyahu Still Endorse "Two State" Solution? PM Netanyahu addressing the Assembly less than an hour after President Abbas: “I say to him and I say to you: We won't solve our conflict with libellous speeches at the UN. That's not the way to solve it. We won't solve our conflict with unilateral declarations of statehood. We have to sit together, negotiate together, and reach a mutual compromise, in which a demilitarized Palestinian state recognizes the one and only Jewish State.” See Film Report: “Palestine/Israel-Still Two State Solution?”.